The first postage stamps of Estonia were issued in November 1918, just a few days after the armistice that ended World War I. Three currencies were used in Estonia, during the time of the republic. They are the Russian Ruble (1 Ruble = 100 Kopecks) from 1918 to 1919, the German Mark (1 Mark = 100 Penni) from 1919 to 1928, and the Estonian Kroon (1 Kroon = 100 Sents) after 1928. 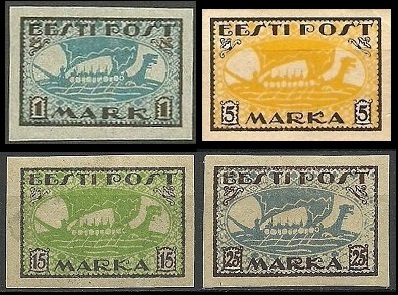 The four definitive stamps of Estonia shown above were issued in 1918 and in 1919. The stamps are lithographed on unwatermarked paper, and they are imperforate. These stamps do exist with unofficial private perforations. The design consists of tablets containing the inscription EESTI POST and the denomination. The background of the stamps has a floral pattern. 05 K. (1918 - Sc. #1) - Pale Red. 15 K. (1918 - Sc. #2) - Bright Blue. 35 P. (1919 - Sc. #3) - Brown, Olive. 70 P. (1919 - Sc. #4) - Olive Green. 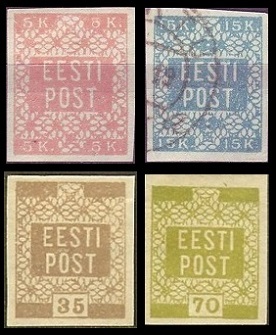 Due to a shortage of postage stamps of Estonia, supplies of contemporary Russian Imperial definitive postage stamps were hand-stamped "Eesti Post" in violet or black on May 7, 1919. These are known as the Tallinn Provisionals. Two certified examples, from a Siegel auction, are shown above. 01 K. (1919 - Sc. #8) - Orange. 02 K. (1919 - Sc. #9) - Green. 03 K. (1919 - Sc. #10) - Red. 05 K. (1919 - Sc. #11) - Claret. 10 K. (1919 - Sc. #12) - Dark Blue - Black hand stamp. 10 K. (1919 - Sc. #13) - Dark Blue - Violet hand stamp. 10 K. on 07 K. (1919 - Sc. #14) - Light Blue. 15 K. (1919 - Sc. #15) - Red Brown & Blue. 25 K. (1919 - Sc. #16) - Green & Violet. 35 K. (1919 - Sc. #17) - Red Brown & Green. 50 K. (1919 - Sc. #18) - Violet & Green. 01 R. (1919 - Sc. #19) - Pale Brown, Brown, & Orange. 10 R. (1919 - Sc. #20) - Scarlet, Yellow, & Gray. 01 K. (1919 - Sc. #21) - Orange. 02 K. (1919 - Sc. #22) - Green. 03 K. (1919 - Sc. #23) - Red. 01 R. (1919 - Sc. #24) - Pale Brown, Brown, & Orange. 03 1/2 R. (1919 - Sc. #25) - Maroon & Green. 05 R. (1919 - Sc. #26) - Dark Blue, Green, & Pale Blue. For the casual Estonia stamp collector, this may be a series that is best avoided. Forgeries of these provisional overprints are abundant. I looked all over the internet, and I could only locate five certified examples, having been sold in a Robert Siegel Auction sale. There were some others on eBay that were advertised as being "signed". They may or may not be authentic. Some of the overprints I saw were so crisp and perfect that they should immediately trigger suspicion. The expert markings have also been forged in the past. 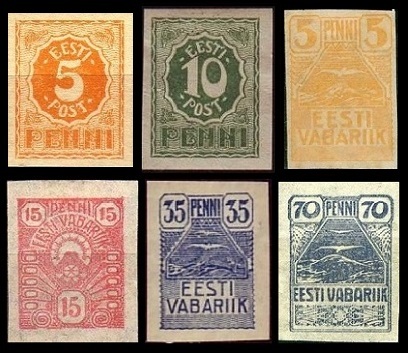 The six pictorial definitive stamps of Estonia shown above were issued in 1919 and in 1920. The stamps are printed on unwatermarked paper. 10 P. (1919 - Sc. #28) - Green. 05 P. (1919 - Sea Gulls - Sc. #27) - Yellow. 05 P. (1919 - Numeral - Sc. #29) - Orange. 10 P. (1919 - Sc. #30) - Green. 15 P. (1919 - Sc. #31) - Rose. 35 P. (1919 - Sc. #32) - Blue. 70 P. (1920 - Sc. #33) - Dull Violet. 01 M. (1919 - Sc. #34) - Blue & Black Brown. 05 M. (1919 - Sc. #35) - Yellow & Black. 15 M. (1920 - Sc. #36) - Yellow Green & Violet. 25 M. (1920 - Sc. #37) - Ultramarine & Black Brown. 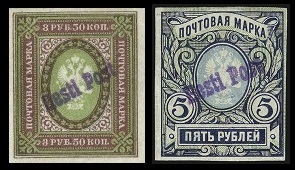 The 1 M. and 5 M. denomination stamps were also printed on grayish granite paper in 1920. They are actually less expensive than the stamps issued on regular paper during 1919. 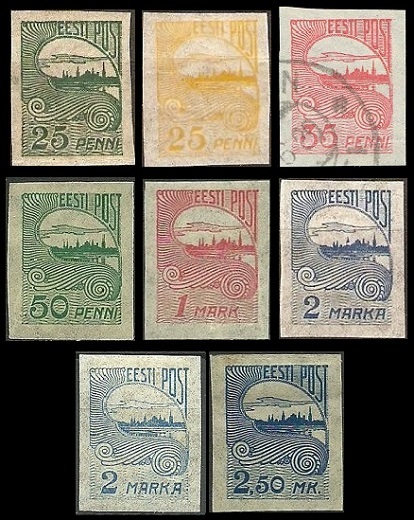 The eight pictorial definitive stamps of Estonia shown above were issued in 1920 and in 1924. The stamps are printed on pelure paper, and they are imperforate. The common design of these stamps features the skyline of Tallinn. 25 P. (1920 - Sc. #39) - Green. 25 P. (1924 - Sc. #40) - Yellow. 35 P. (1919 - Sc. #41) - Rose. 50 P. (1921 - Sc. #42) - Green. 01 M. (1920 - Sc. #43) - Vermilion. 02 M. (1920 - Sc. #44) - Blue. 02 M. (1920 - Sc. #45) - Ultramarine. 02.50 M. (1920 - Sc. #46) - Blue. The three pictorial definitive stamp types of 1919 to 1920 shown above were overprinted and re-valued during 1920. 01 M. on 15 P. (1920 - Sc. #55) - Rose. 01 M. on 35 P. (1920 - Sc. #56) - Rose. 02 M. on 70 P. (1920 - Sc. #57) - Dull Violet. Perforation trials of the 15 K. denomination stamp, shown above, were ordered by the Estonian Postal Service. The trials were made on printers-waste from the first and second printings, and they are perforated 11 1/2. The trials were not considered successful, and further testing was canceled. The exact number of stamps printed and sold is unknown. This perforated 15 K. denomination stamp is the rarest of all the stamps of Estonia. Only two or three covers with the stamp are known. Mint singles are exceedingly rare. It is estimated that 1,000 of them may exist. Many of these perforated stamps, found in collections and on the philatelic market, are forgeries or have private perforations.